Marvel’s Avengers® Super Shaped Nuggets! Disney® Winnie the Pooh Inspired Nuggets! Chicken breast meat, water, rice starch, sea salt. 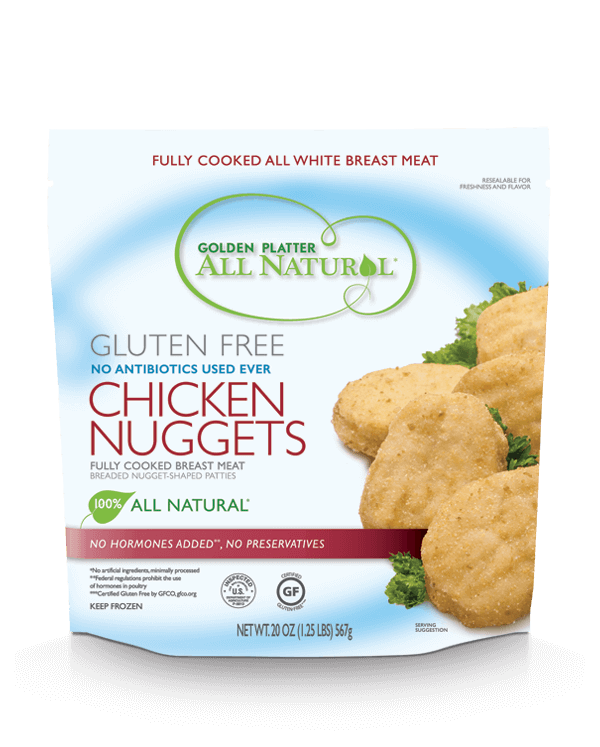 Breaded with: Yellow corn flour, rice flour, water, yellow corn meal, rice starch, corn starch, sea salt, dextrose, garlic powder, onion powder, spice, yeast extract, breading set in non-hydrogenated soybean oil. Place frozen tenders in a single layer on baking sheet. Place sheet on middle of rack and bake for 12 to 14 minutes. Turn tenders halfway through heating time. Place frozen tenders in a single layer on microwave safe plate. Heat, uncovered, on high: 3 tenders for 1 1/2 minutes, 6 nuggets for 2 1/2 minutes. OUR PRODUCTS INSPIRE PEOPLE TO BRING EASY, HEALTHIER MEALS TO THE TABLE. Need More Gluten Free Goodness? Sign up to our mailing list for the latest news and promotions from Golden Platter. ©Copyright 2019 Golden Platter. Site by GooseWorks. Enter to win a $50 Gift card by filling out our survey in the link below.